You are looking at the classic pot o' greens. This was a two-hour endeavor -- not counting washing and trimming the greens, which Cranky picked up fresh at the farmers market this morning. You have to be careful what you talk about while you're still snuggling in bed with the Sunday paper. I mentioned greens, merely because I think our diet could use some healthin' up. Cranky was all, like, "Bang! Wow! Done." Still, largely, nothing wrong with that. I'm traditionally the greens cook around here, but we collaborated today, and I know that Cranky picked up some really good lessons. He also cooked a pot of rice and a pot of red beans; combine however you see fit. That dude is my salvation. Sunday Soul Food...great choice. We usually do a pot a month with hamhocks and also mix it up with both mustard and collard greens. Simply: Oh, right on! I would love this once a month. 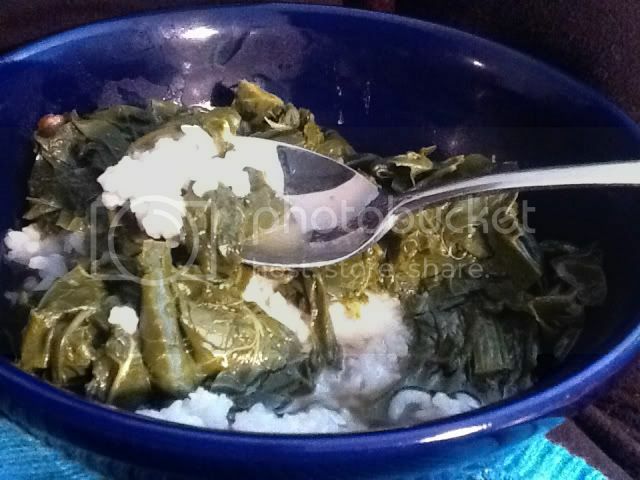 This was collards and mustard greens (the latter only cooked half the time) and some other greens, I forgot what. J'adore les hamhocks. We usually eat them with red beans and rice. Nice to see you! Happy seasonal felicitations. I GOT THE WREATH UP ON THE FRONT DOOR. GASP. We got up late and went to the Kensington market. We got there at 955 AM and they were still setting up.We hit and run. I thought Marin was laid back. The Raiders just hit a field goal and are winning for this second. Yeah, Cranky is pretty Kool! It was not my own bacon; some Nieman Ranch stuff that's pretty good. I'm saving my own bacon for Tater Tots. Not! You like the stewed greens? We got a load of pot likker. We've wild (well, feral) greens in the garden at the moment, as tall as me. Time to cook 'em down. I keep eyeing the greens in the markets but I'm not in the mood quite yet. After Christmas seems like a good time to start. Cranky - A man with a plan! I love how quickly it turned from "healthin' it up" to "rashers of bacon." As it should be. You eat greens only once a month? It's once a week at Chez Nancy, using my home made stocks of various kinds, mostly not made with pork. If you want a great tasting stock, try smoked turkey legs and cook the greens in that. I sometimes have rice and beans but more often, I have Quinoa as my side dish. OR eat them with poached eggs. OR just by themselves, seasoned with lemon zest and hot chili oil. Now that's good eats. Zoomie: Never force it. You will know when you're ready. Greg: Yes! Have you seen his Panama Canal? Nancy: Oh. Mah. Gah. Quinoa and a poached egg sounds wonderful with a drippy bowl of greens. Merci! All that's missing is hot cornbread. That's absolutely required with a mess o' greens. Zoomie can wait for Jan. 1 and the greens will symbolize the wish for "folding money" in the new year, along with blackeyed peas (coins). kudzu - Oh yes, babe! Cornbread and greens and black eyed peas and rice. I always cook a real Southern brunch for my friends but so far, no huge amounts of money have materialized. However, they all go home, stuffed and satisfied so that's the coinage of friendship. Not such a bad exchange at all. Kudzu: Lacking the proper dose of "Southern" in my DNA, I tend to overlook the cornbread. I do still want to experiment with cush-cush! I think the cornbread would be the best part. I have a recipe that uses fresh corn kernels as well as corn meal.